Ever wanted to know what the hell the US is up to? 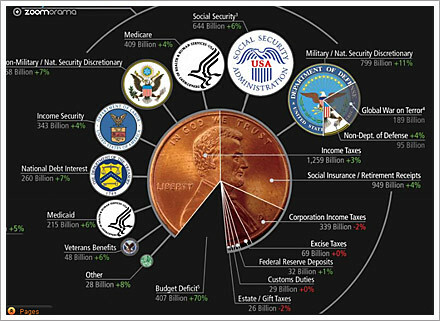 This nicely presented zoomable wall chart details all the spend. Most importantly it gives a detailed look at the discretionary spend of $1182 billion that must be approved by congress. Scary things is they are looking at a 70/30 split with 70% of all that 1182 Billion going to ‘Security/National Defense’. Thats a whole lot of Homeland security and all sorts of other lovely stuff. Regime change begins at home I feel.